VANCOUVER — The record is easy to see, results that can tell the story of a sports season. The heart cannot be seen, though, and the heart has a story to tell, as well. 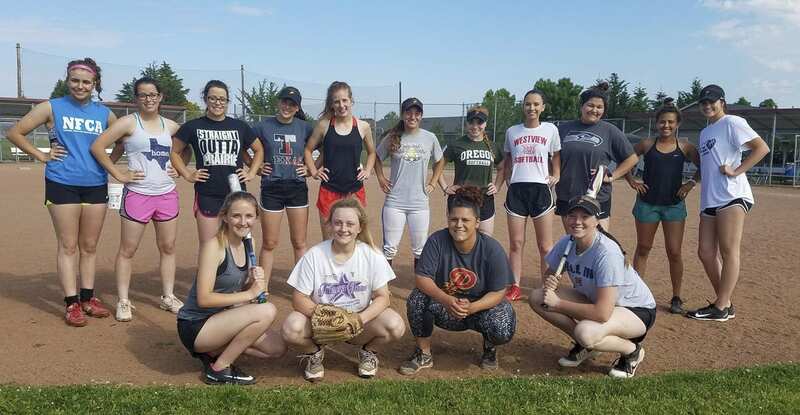 It is the Prairie heart that the Falcons want to showcase this week at the WIAA Class 3A state softball tournament in Lacey. It is that heart, after all, that got them there. The Falcons turned a forgettable regular season into a memorable postseason last week, finishing second in the bi-district tournament and qualifying for state. Prairie had a pedestrian 10-9 record prior to the playoffs — a team that had started the season with question marks and was still questioning itself deep into May. The three captains of this squad — Clarissa Martinez, Ashley Shelton, and Kylee Snider — acknowledged there were trust issues as the team tried to regroup after so many talented players had graduated the previous two seasons. There were other behind-the-scenes problems, too. It all worked itself out, though, at the perfect time. The captains credit coach Mariah Dawson for preaching team, team, team. The Falcons finally got the message, then they finally starting playing to their potential. And lifetime memories of making it to state. Prairie will take on Marysville-Pilchuck at noon Friday in the opening round. The tournament is held at the Regional Athletic Complex in Lacey. The Falcons won two in a row to open bi-district, including a victory over Yelm, one of the top programs in the Northwest, to qualify for state. “We had to play our hearts out. That’s how we beat them,” Shelton said, helping to make that whole heart thing become a theme. A scheduling quirk had Prairie playing those first two games on a Thursday, then returning for the semifinals and finals on Saturday. That meant they got to go home Thursday night knowing they were going to state. The Falcons returned Saturday, got a walk-off home run from Snider in the 10th inning of the semifinals, and eventually finished second in the tourney. By then, they had accomplished what they set out to do — they had earned one more week with their sisters. These Falcons also got to add to a special legacy. This will be the 12th appearance at state for the program since 2000. This might be the most surprising team of the dozen to reach the sweet 16, based on that 10-9 mark before last week. But here are the Falcons, still playing. In fact, that record might have helped last week. Now, the Falcons can laugh about the first game at bi-district. They won 17-9 but were not happy with their defense. At least they had their bats, though. Snider had four hits, including a home run, and drove in four runs. Carly Wentworth hit a home run. Olivia Meyers drove in three runs. Next came the Yelm game. Win this one, go to state. Lose, travel through the unpredictable consolation bracket. The Falcons got the win, 6-3, scoring four runs in the top of the seventh to break a 2-2 tie. The captains had the four RBI in that frame. The Falcons got past Stadium in 10 innings in the semifinals, thanks to a change of strategy from their opponents. After intentionally walking Snider three times, Stadium decided to pitch to her. Whoops. “I tried to show them why they walked me in the first place,” said Snider, who ended the game with a two-run home run. Meyers, by the way, struck out 13 in her 10-inning complete game, giving up two earned runs in the victory. The bats. The pitching. The defense. It is all working for the Falcons. But it all started with stuff that cannot be defined by statistics.